Whales near the Arctic Watch Wilderness Lodge. 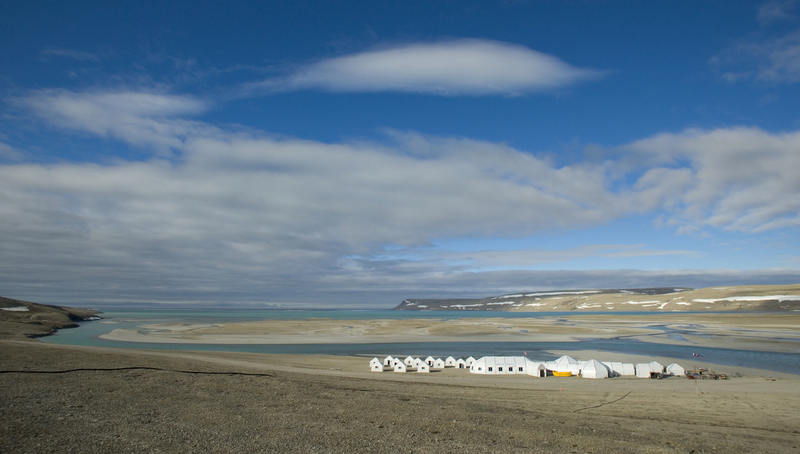 The Arctic Watch camp on the cold arctic tundra. 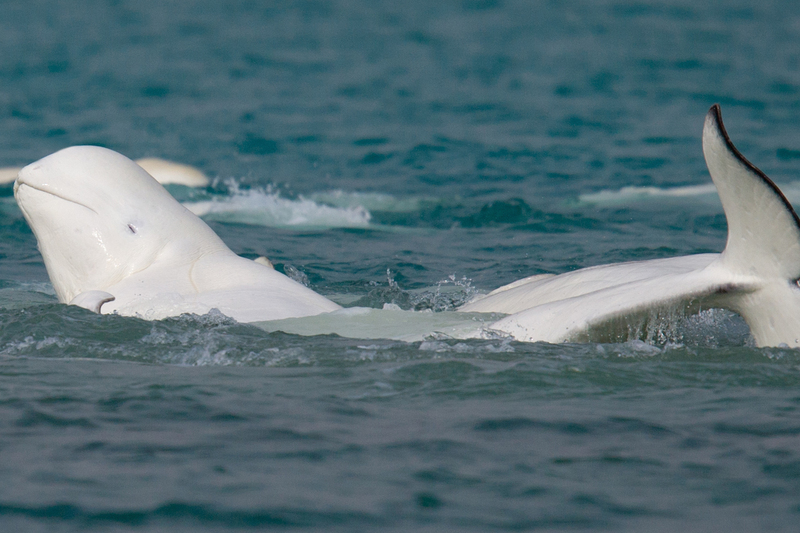 Go deep into the frozen reaches of Canada in Nunavut with an Arctic Watch adventure. That’s how it feels as your chartered plane descends to Somerset Island, deep in Canada’s northern-most and least populous territory of Nunavut, 800 kilometres above the Arctic Circle. Open only in the summer months, when the sun never sets on the untamed tundra, no humans permanently dwell here – but you are far from alone, as you’ll discover on this week-long safari. Riding trails on an All Terrain Vehicle, you’ll pass Arctic foxes, snowy owls and herds of musk ox. 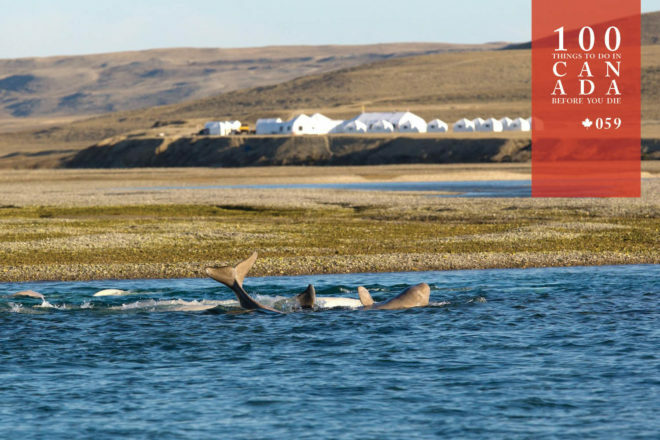 Kayak the Cunningham Inlet and see ringed and bearded seals, the polar bears that feed on them, and beluga whales in the ice-chunked waters. 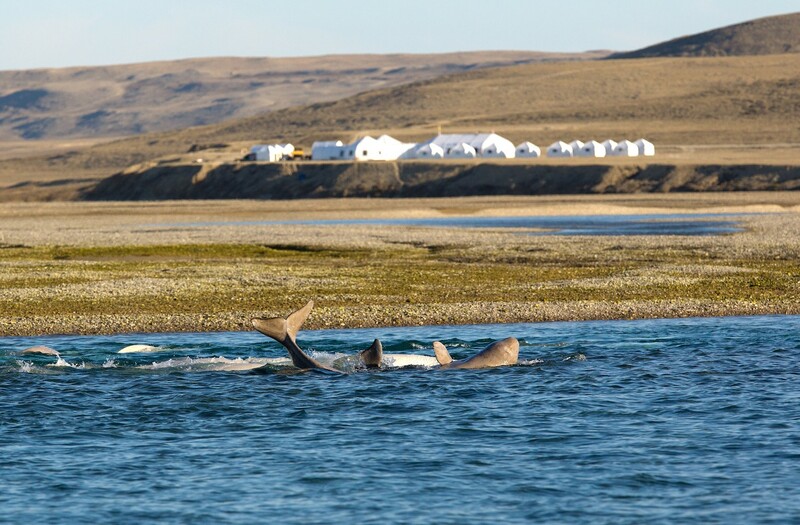 A thousand years ago, these beasts provided food and raw materials to the Thule –ancestors of modern Inuits – where their ruined whalebone dwellings still stand. Your quarters at Arctic Watch Wilderness Lodge are in better condition – a high-tech tent with a real bed, hot-water bottle, shower, and chefs cooking delicacies such as roast musk ox paired with wines. It’s a taste of the civilisation to which you must all too soon return. Book your bed at Arctic Watch Wilderness Lodge (arcticwatch.ca). More details here. The chartered plane to the Wilderness Lodge leaves from Yellowknife, Northwest Territories. Daily flights to Yellowknife arrive from Edmonton, Calgary and Vancouver.